A modem can be used to configure an Internet connection over an active phone line. An Internet Service Provider (ISP) account (also called a dial-up account) is required. 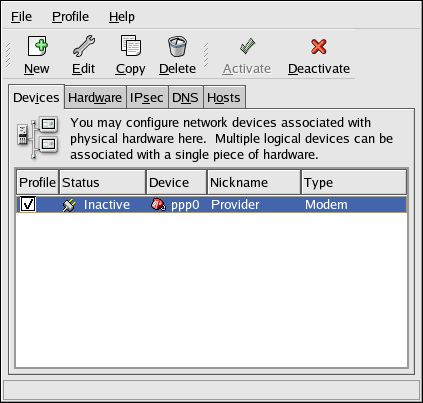 Select Modem connection from the Device Type list, and click Forward. If there is a modem already configured in the hardware list (on the Hardware tab), the Network Administration Tool assumes you want to use it to establish a modem connection. If there are no modems already configured, it tries to detect any modems in the system. This probe might take a while. If a modem is not found, a message is displayed to warn you that the settings shown are not values found from the probe. After probing, the window in Figure 14.6, “Modem Settings” appears. Configure the modem device, baud rate, flow control, and modem volume. If you do not know these values, accept the defaults if the modem was probed successfully. If you do not have touch tone dialing, uncheck the corresponding checkbox. Click Forward. If your ISP is in the pre-configured list, select it. Otherwise, enter the required information about your ISP account. If you do not know these values, contact your ISP. Click Forward. On the IP Settings page, select whether to obtain an IP address automatically or whether to set one statically. Click Forward when finished. 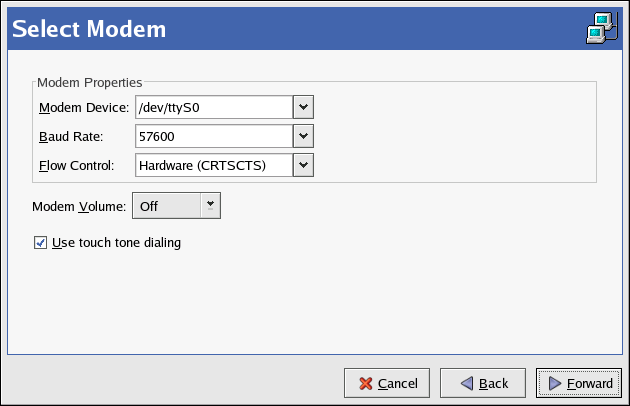 After configuring the modem device, it appears in the device list with the type Modem as shown in Figure 14.7, “Modem Device”. After adding the modem device, you can edit its configuration by selecting the device from the device list and clicking Edit. For example, when the device is added, it is configured not to start at boot time by default. Edit its configuration to modify this setting. Compression, PPP options, login name, password, and more can also be changed.